1. Preheat the oven to 190°C, gas mark 5. Thickly slice the leek and cook in salted boiling water for 3 minutes. Meanwhile, trim the greens, cut into thick strips and wash in cold water. Add to the pan with the cavolo nero, cover and cook for 3 minutes until just tender. Drain and leave in the colander while you prepare the sauce. 2. Trim the salad onions and cut into 2-3cm lengths. Melt 40g of the butter in a small pan, add the salad onions and sauté briefly until tender. Remove from the pan with a slotted spoon and set aside. Add the flour to the remaining butter in the pan and stir over a low heat to make a roux. Gradually add the stock, stirring until smooth. Simmer for 2-3 minutes then add the cream and mustard and cook for a further minute. Season and remove from the heat. 3. Trim the rind from the Taleggio and cut the cheese into cubes. Use the remaining butter to grease an ovenproof dish and add a third of the greens, leeks and salad onions. Scatter with a third of the Taleggio and ham. Repeat these layers twice more. 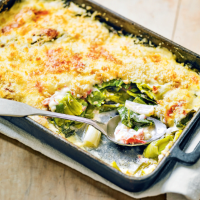 Spoon over the sauce, scatter with Parmigiano Reggiano and breadcrumbs and bake in the oven for 25 minutes until golden and bubbling. Serve with crusty bread.